The adjoining Gwynns Falls Park and Leakin Park, in Baltimore, Maryland, United States, generally referred to as "Gwynns Falls/Leakin Park," covers 1,216 acres (492 ha) of contiguous parkland, forming the most extensive park in the city. Gwynns Falls-Leakin is a wilderness, heavily forested and largely left in its natural state, somewhat like Herring Run, but unlike other large urban parks in Baltimore city such as Druid Hill or Patterson, which have some tree cover, with open meadows and mowed lawns in between. Baltimore's Department of Recreation and Parks operates Gwynns Falls and Leakin as a single park, beginning at the western edge of the city, following the Gwynns Falls stream from Windsor Mill Road (northwest) to Wilkens Avenue (southeast). Franklintown Road serves as the main vehicular route through the park, as a continuation of Dogwood Road from the Baltimore County suburb of Woodlawn. It exits the park near West Lafayette Avenue further into the city. Although surrounded by an urban environment, some areas of the park are so heavily wooded that they give the impression of wilderness. Portions of the 1999 horror film The Blair Witch Project were filmed here. The combination of its many secluded areas and easy vehicular access has in the past given it a reputation, in Baltimore and beyond, as a place where bodies of murder victims are frequently found. In the early 2010s the park began efforts to change that by barricading many dead-end access roads from high-crime neighborhoods adjacent to it. The properties which eventually became Gwynns Falls Park started with a small parcel of land southwest of Edmondson Avenue, selected by the Baltimore City government in 1901 to serve as a park, anticipating the needs of a growing population. In their plan for the "Greater Baltimore Public Grounds," prepared for the Baltimore Municipal Arts Society in 1904, the Olmsted Brothers recommended acquiring land along the Gwynns Falls for a stream valley park. Gwynns Falls Park was established by the City of Baltimore in 1908 with the addition of other properties to the land purchased in 1901. In the 1960s, federal, state and city transportation planners proposed routing Interstate 70 through the Gwynns Falls Valley and the Park. The westbound interstate was to continue from its current eastern terminus at the Security Boulevard/Cooks Lane interchange and run towards an intersection with Interstate 95, which runs from the northeast to southwest through the city; a spur route, Interstate 170, was to begin there, and serve downtown via the neighborhoods immediately west of it. This extension was canceled officially in the early 1980s due to heavy sustained local opposition. A bequest from J. Wilson Leakin in 1922 provided funding for a 300 acre addition to the park, purchased as two parcels in 1941 and 1948 from the descendants of Thomas de Kay Winans (1820–1878). A stipulation of the bequest required the city to name this portion of the park for Leakin's grandfather, Shepard A. Leakin. The property purchased from the Winans family was previously known as the Crimea. Thomas Winans named his Baltimore property after the Crimean peninsula in Ukraine. 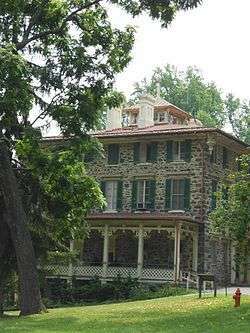 In 1856, Winans built a villa on the property, which he called the Orianda House. His villa continues to stand in Leakin Park, at 1901 Eagle Drive. The parks are included in the Baltimore National Heritage Area. Plans to build a two-mile-long gas pipeline through a heavily wooded section of the park were questioned by the Friends of Gwynns Falls/Leakin Park organization in September 2013. The pipeline will replace an aging pipeline originally installed in 1949 along Dead Run, a tributary of Gwynns Falls. Initially, Baltimore Gas & Electric Company planned a replacement line running mostly along the park's southern border. An alternative suggestion would move more of the line to the southern border at the neighborhood of West Hills. Either route will require extensive clearing of trees that are more than 100 years old, because the new pipeline requires a 40-foot wide access corridor to be kept clear of trees. Running the pipeline along the existing route would involve a serious environmental impact, due to its proximity to Dead Run. This alternative also involves extensive clearing, because the new pipe must be located at least 75 feet from the old line to satisfy safety requirements. The access corridor along the old pipeline is only 26 feet wide. 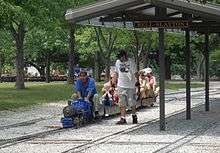 Chesapeake & Allegheny Live Steamers, a miniature steam-powered railroad with 3,400 feet of track, provides free rides every second Sunday, April through November. Baltimore Herb Festival, held annually in May. Carrie Murray Bug Fest, held annually in September at the Carrie Murray Nature Center. Leakin Park has a reputation as a dumping ground for the city's murder victims. It has been described as "the city's largest unregistered graveyard." A webpage devoted to tracking the bodies found there counts 71 since the 1940s; its compiler says the actual number is probably higher due to incomplete archives of the Baltimore Sun. This aspect of the park has been referenced in works of popular culture set in Baltimore. In an episode of The Wire, a police detective recalls checking the park for a body earlier in his career and being told only to care about ones that fit the victim's description. "We're looking for one body in particular—if you go grabbing every one you see, we'll be here all day," he recounts being told. The 2014 podcast Serial focuses on the creator's attempts to reinvestigate the death of Hae Min Lee, found in the park in 1999. The best-known of the bodies to be found in the park is that of Eugene Leroy Anderson, a local 20-year-old whose skeletal remains were found off Stokes Drive in October 1969. It was believed that his fellow Black Panthers had tortured and killed him that spring after discovering he was an FBI informant. However, when four other Panthers were prosecuted for the crime in 1971, witnesses who had been informants themselves gave inconsistent accounts of how the crime took place. Only one defendant was convicted, later pardoned by Governor Marvin Mandel. The crime remains officially unsolved. Several factors made Leakin attractive to criminals disposing of bodies. It borders on Edmondson and Wallbrook, two high-crime neighborhoods of the city. Franklintown and Windsor Mills roads, which cross the park, are "easy thoroughfares to get in and out of a secluded area after illegal acts" in the words of Rona Kobell, a former Sun reporter writing in Slate. And many short dead-end roads entered the park from the surrounding neighborhoods. ... but those bodies end up there because a city was and is willing to embrace a wild, wide space inside its boundaries. So Leakin Park is also about the elderly Koreans who gather chestnuts every fall, about the middle-aged black women who began playing tennis there after Arthur Ashe won the U.S. Open, about the truly outsider art gallery along some of the park’s trails. Leakin Park is about the grand Olmsted vision as well as the grimmer reality. 1 2 "About Carrie Murray Nature Center". Friends of Carerie Murray Nature Center. Retrieved June 13, 2013. 1 2 3 "History of the Park" Friends of Gwynns Falls Leakin Park. Retrieved 2010-09-28. 1 2 3 "Gwynns Falls/Leakin Park". City of Baltimore Department of Recreation and Parks. Retrieved June 13, 2013. 1 2 Evan Balkan (2006). 60 Hikes within 60 Miles. "Leakin Park", pp 60-64. Menasha Ridge Press. ISBN 9780897326230. ↑ "Trail Info" Gwynns Falls Trail Council. Retrieved 2010-09-29. ↑ Kozel, Scott (2003). "Baltimore Early Expressway Planning". Roads to the future. Retrieved October 13, 2014. 1 2 The Orianda House. Friends of the Orianda House (March 2010). Retrieved 2010-09-30. 1 2 3 Timothy B. Wheeler (September 26, 2013). "Park pipeline stirs furor". The Baltimore Sun. p. 1. ↑ Chesapeake & Allegheny Live Steamers. Chesapeake & Allegheny Stream Preservation Society (September 7, 2010). ↑ Hermann, Peter. "Urban oasis turns into a graveyard Slaying victims are found frequently in city's Leakin Park". Baltimore Sun. Retrieved 20 November 2014. ↑ Worthing, Ellen (January 6, 2011). "The Bodies of Leakin Park". Blogspot. Retrieved November 21, 2014. 1 2 3 4 Kobell, Rona (November 17, 2014). ""Where West Baltimore Brings Its Dead"". Slate (website). Retrieved November 21, 2014. ↑ "Alliances". The Wire. Season 4. Episode 5. October 8, 2006. ↑ "SEASON ONE: EPISODE 03 - LEAKIN PARK". Serial. WBEZ Chicago Public Media & Ira Glass. 2014. Retrieved October 12, 2014. Gwynns Falls/Leakin Park Baltimore City Department of Recreation and Parks. Gwynns Falls Trail Map of Gwynns Falls Trail with Leakin and Gwynns Falls Parks.